Hi all! after thinking and thinking how to solve the problems of those ugly orange colors that appear in the hat .... I sent an e-mail to haed .. but there was no response and I had to ginger up so .... the I hope it's good result!! I had some task to undo the piece to differentiate the colors orange. I hope to put new very soon! This is my little progress on Angelic. I am advancing quite slowly because I don’t have a lot of time to stitch. 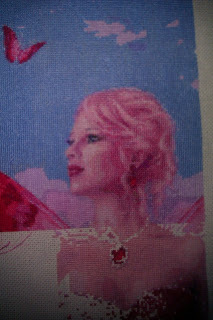 Furthermore, I have started another chart: Queen of Hearts, (It's an Rachel Anderson's art). 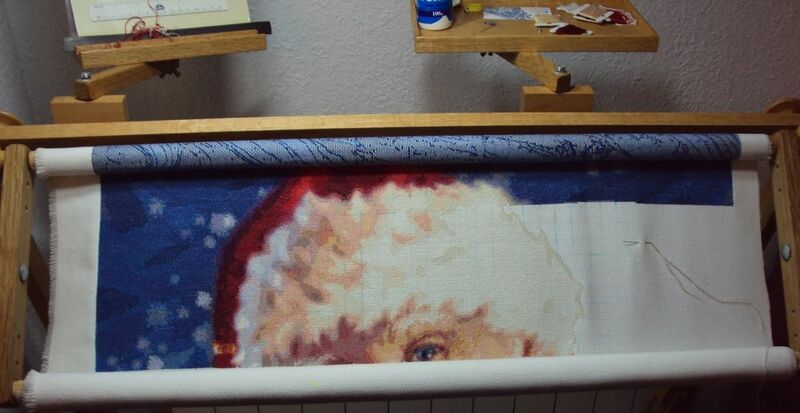 I am making it on 25 count lugana fabric, 1 over 1. This is my first time stitching with frame, and some times I feel that I don’t advance, but I have to learn to stitch with frame. I am working on Eldar by Randal Spangler. 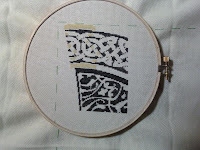 I am working him on 20 ct. Aida, with one thread of DMC. I haven't got a lot done so far but I have attached my progress as of today. Sorry not good pics, don't know how to fix them. I have really big hopes of finishing him for my Grandson Kane's birthday next MAY so I have to keep motivated. Mad Tea Party Update - Mel "Romantic Fool"
Yay! I finished one whole page of Mad Tea Party. Now countless more to go!!! 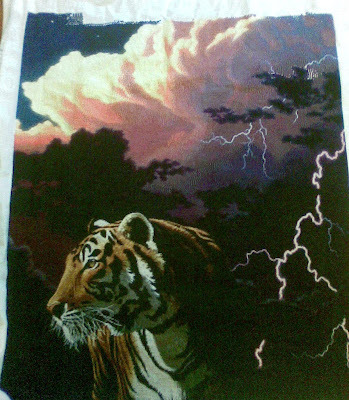 This one I am stitching 2 over 1 on 25 count fabric. I typically stitch 1 over 1 so this is an "experiment". 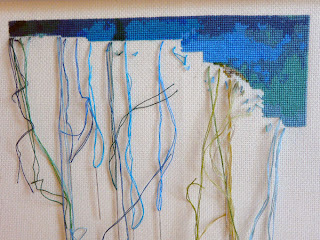 I am liking the "tapestry" look of the piece but it does take a little longer to stitch because there are times it gets "tight" to pull the needle through. 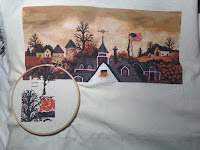 I am not sure I will work on this piece again this year but I did complete the one stitching goal I had for it this year which was the completion of one page. 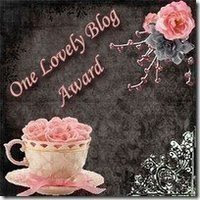 Thank you to Louanne for making me a member of this blog. 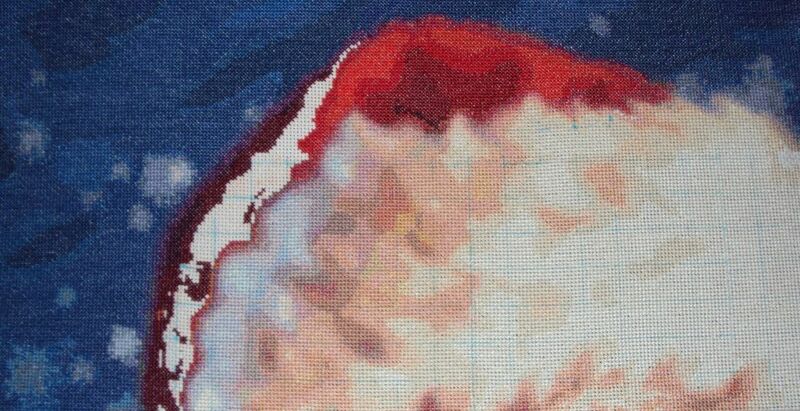 The one I am working on now is Ruby by Anderson. 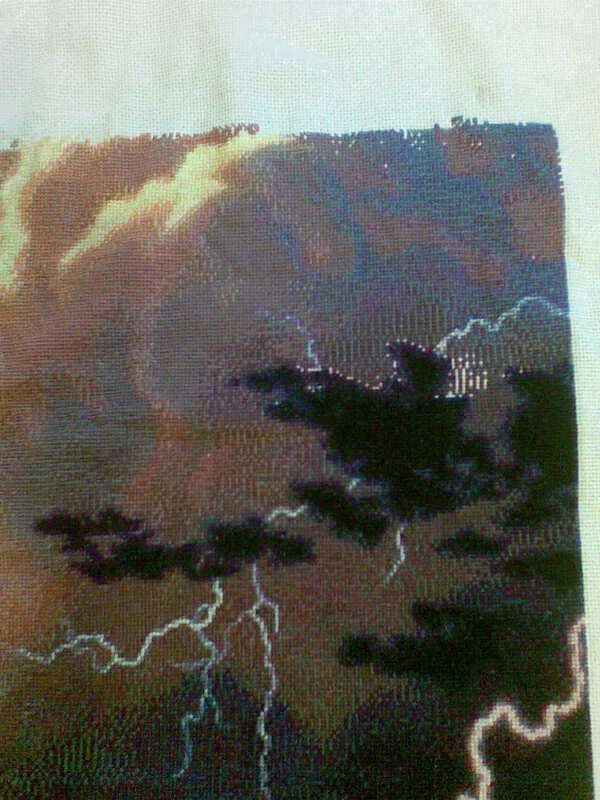 It is stitched on 25 count evenweave, 1 over 1, full cross. What do you think? I think she's come out beautifully if not much larger than expected, definately not bookmark size. She's gonna be a little awkward to frame as I chose the fabric thinking that she'd become a usable bookmark and then she turned out to be far to big for that. I have an idea of what I'm going to do but we'll see!! half a page of Alice is ready. I am delighted to see a great deal. We woke up this morning in a frozen world. For the first time this is pretty frozen. Not yet seen snow. I have brownies in the oven. So with a nice cup of coffee, we can handle the frost. Last week I cast my way to the Madonna. I want her so much done this year. And there is only one hitch to come and then it will not work. Still about 14,000 stitches to go. If you would like something then it usually succeeds. Well I haven't gotten much to speak of done on "Vibrant Vista" or "Wolf Countess" this week, but I did get a pretty good start on the first of three stockings I will be stitching! 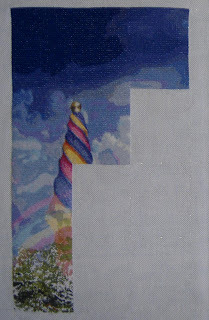 This is my progress so far on the "Emerald Stocking" by Cari Buziak. 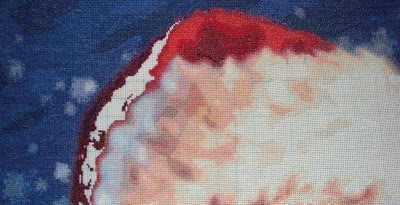 I love all three of the stocking patterns and this is stitching up remarkably quickly for all the details! Mostly black so far, but I just started adding some color, a light yellow. It might be hard to see in the picture. It has been sometime since I have posted here, but I always check here to see everyone's progress and finishes. This is Faery Tales by James Christensen. When I ordered this I chose the large chart, and it ended up being 60 pages, not all are full pages but I count them any way LOL. So far I have completed 23 full and partial pages. I love watching the picture emerge. 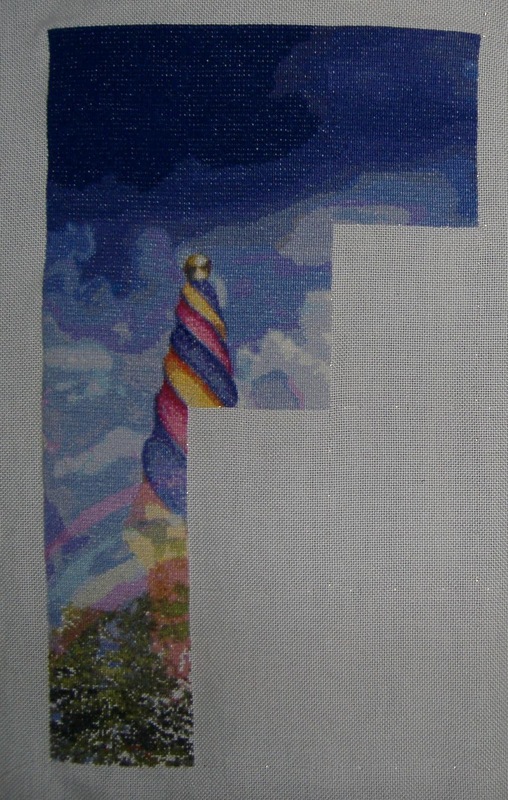 In the sky part I was completing a vertical row of ten stitches every few days, but now that there is alot of confetti stitching it is taking me much longer to complete a row. 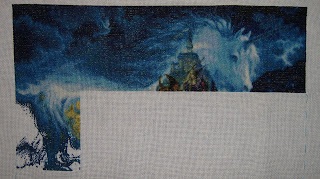 Here is a picture of the whole lot and below a closer shot of where I am currently stitching. 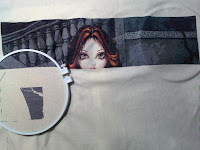 I have been working on other things, if you would like to see come visit me at my blog. Everyone's progress is amazing. Im sorry i have not updated lately. i have some progress. I only managed 200 stitches last night. I put this in direct sunlight and got a fairly decent picture of my progress that shows the lovely blues on this design. This is another half page--my goal is a 1/2 page per month. That leaves me a week or so each month to work on other projects. I'm thinking of starting Christensen's Touching the Hem of God but not stitching the background. I got a lovely teal material to take care of that. So as soon as I get Christmas gifts done, hopefully I'll have two progress pics every month. Maybe starting in January. Hope springs eternal! I am so excited to be part of this blog, and so glad that Joke agreed to be my buddy! Here is my first HAED - James Christensen's QS Fantasea. I started this in 2006, stitched for 7 hours, then didn't touch a needle for over four years. 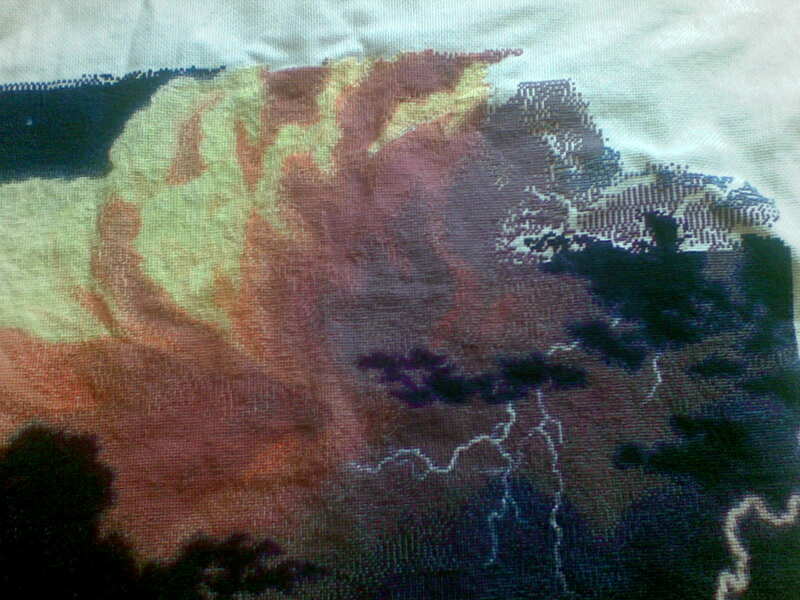 So, here she is at 21 hours (2,758 stitches, 10.6% complete). 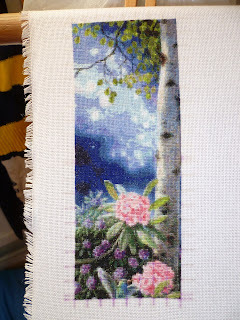 She is being stitched on 22 ct. Hardanger, 2 over 1 with DMC floss. If you look closely, you can see the start of her head! Thanks for looking! Anyway, here's what I've been up to in the last week (besides a hefty amount of playing Super Mario Galaxy 2 on the Wii). I have nearly completed the 1 and a half pages that were left on the second last row of pages. 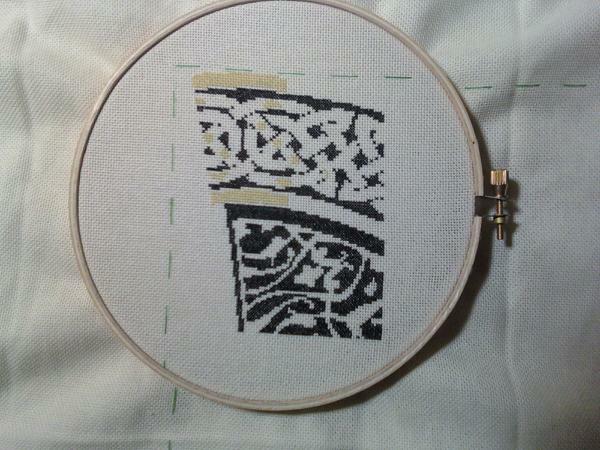 I have run out of one of the colours, a dark grey and you can see the spaces where I need that colour to fill it in. I am waiting until I run out of a couple of more colours before I order more as it is more economical to order 3 than 1. Not much progress at all on this as I have been stitching a set of 6 Christmas Stockings and have 1½ stockings left to stitch. As soon as I've finished the stockings I will get on with this again soon as I am missing stitching it at the moment. 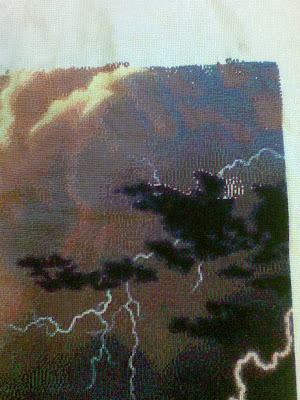 I have also been stitching for a charity auction (see my blog for pics) which has also prevented me from stitching on this. 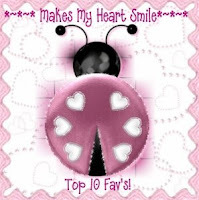 I would like to say a big hello and welcome to all the new faces on this blog. The talent on here never fails to amaze me. Sorry I haven't commented on everybody's posts but I just don't have the time, but I do see them all and marvel! Well here is an update of Dragonfly. I have now completed page 7 and made a good start on page 8. As you can see the wings of the dragon that sits on her shoulder have just started to appear. Keep up the wonderful work everyboyd, I love watching you all progress. You can see its face. 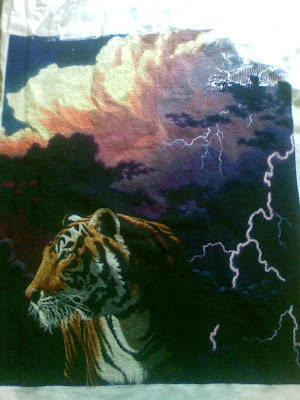 I only have to sitch legs and tail.During the day I stitch dark colours and at nights I stitch yellows and oranges. I'm loving to see all your progresses and your lovely works. It's making me more and more addict to the blog and making me want stitch more and more. Today I finally finished my first page on "Touch of Spring", the page 9 out of 24 (although 9 of them are just bits of pages). I'm now going to work on page 8 since I've a big part of it done. I must say I've tried the tutorial on "how to carry threads" from the blog and it's really good, I noticed that I'm stitching much faster and it made it easier to know where I should start with the thread. Sanne has a very nice Frame selected for the train. About three weeks he is ready. Then I can show it to everyone. Finally almost December. I had the Train of Dreams exactly finished on time. Because I have big plans for the Madonna of Christensen. Who actually I want to have done this year. Now I had to do four pages of the Madonna. I have one finished now. A total of 6200 stitches done this week. Three pages to go. Actually, it must be finished before Christmas because then I have no time to spend on it anymore. So fingers crossed .. 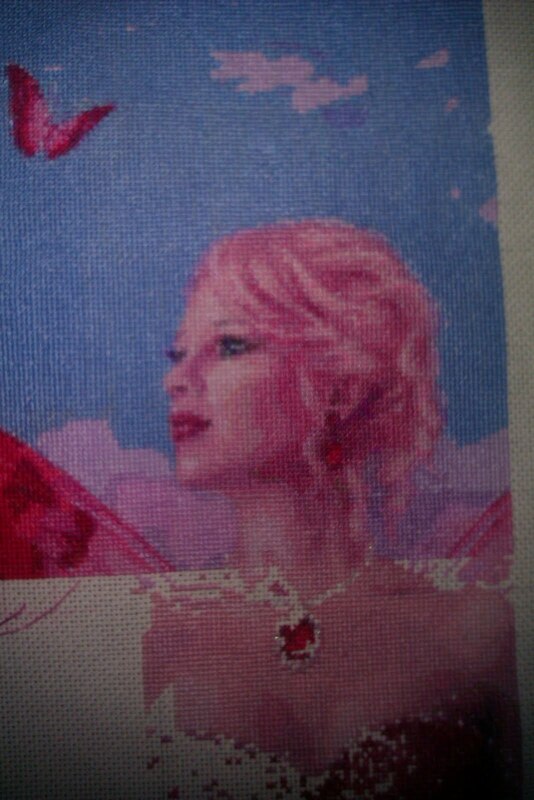 I am currently stitching QS Olivia's Orchard by Hannah Lynn/Disney. It is my first HAED and I'm really enjoying it. To the point that I have also 'secretly' started another one, which is ShhNow! Hi Everyone heres TT Purple Dragon - JBG.She is being stitched on 18 count aida.Two over one.I started her when I was on holiday in September and I have been working on her again for the last week. I love coming on here and seeing everyone elses work. Well done to all. Here's an update on Hannah Lynn's QS Bliss. It is my goal to finish her this year and I thought I would not make it, but I have hope now. I stitched like crazy last week and made a lot of progress. I can't seem to put her down! The laundry is piling up and so is the dust in my house, but I thought I deserved a break. I feel like I had a mini vacation! Really nice. I am amazed at how pretty she is. My name is Carolyn and I am a stitcher from New Hampshire. Thank you for allowing me to join this blog as a buddy. 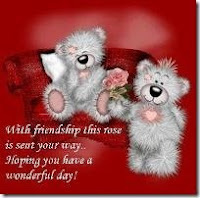 And thanks Terri for being my buddy! I have really enjoyed seeing all of your work and I look forward to sharing mine with you. Vibrant Vista is a gorgeous pattern with lots of beautiful fall colors. And I'm not kidding... LOTS of colors! It gets a little intense with all the confetti at times. Wolf Countess has been a very nice stitch so far though, lots of large blocks of color. I am also about to start another project. I logged onto the HAED website the other night and saw the new Christmas Stocking patterns by Cari Buziak and knew I had to stitch them for my nephew and his new baby brother and sister (expected at the beginning of December!) I am stitching one in each color, Emerald, Ruby and Sapphire. Just got the patterns today, hooray! So be on the look out for the beginnings of that project. 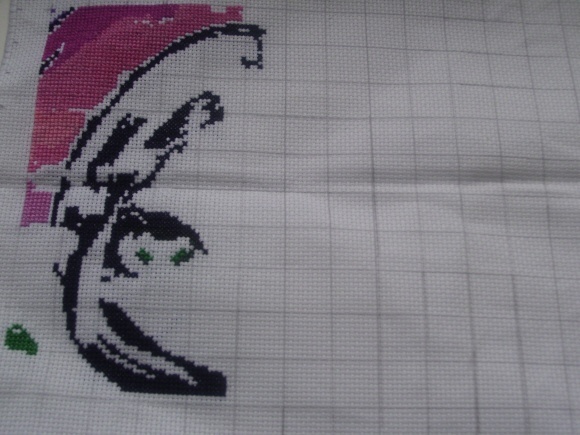 Anyway, off to stitch now! Thanks for looking! Started back on my Forrest Friends. It has been a while since I last posted my WIP here.I had put it aside for about 1 year, but recently, I started back on it. 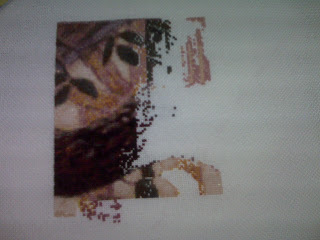 Now I'm enjoying working on this andhave got the 2nd row done. Can you see the deer's ears peeking out? They have made me more motivated to keep going. 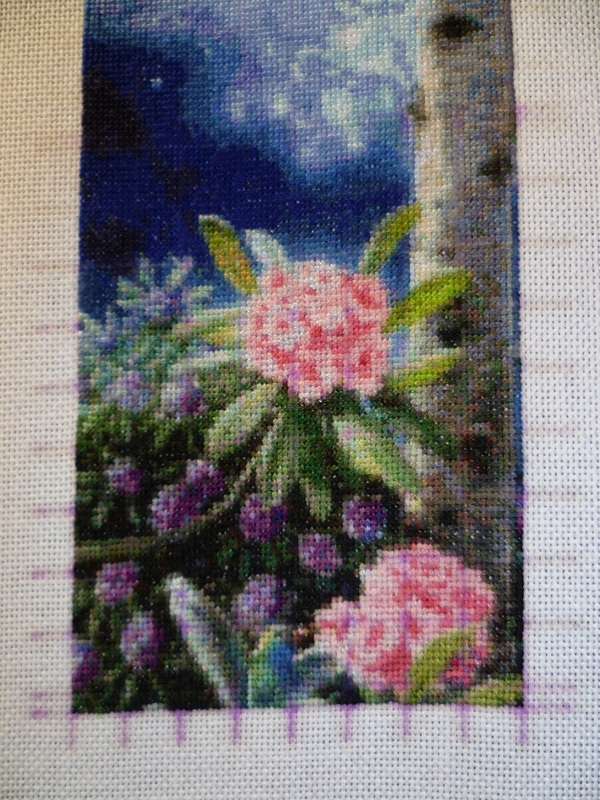 Thanks for looking and happy stitching everyone. 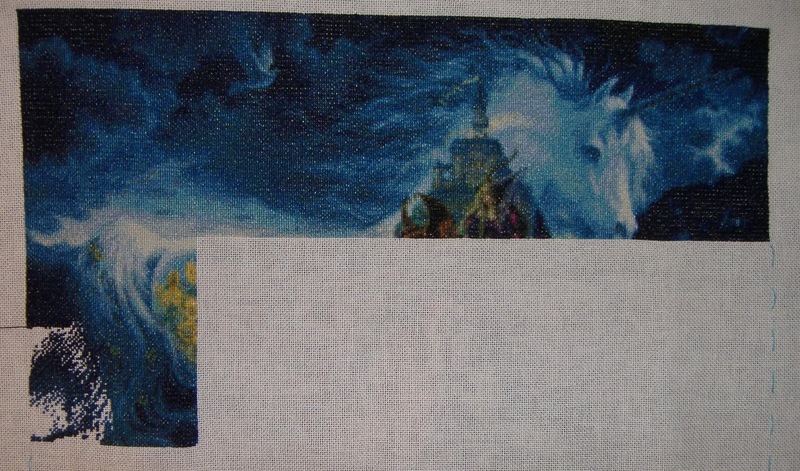 I've cross-stitched for many years, but only recently got a laptop and discovered the world of online designers. I fell in love with HAED at first sight, and am just embarrassed a little by my choice [of patterns]--I began "Isabella" by Molly Harrison at the end of October, and am sewing with DMC mouline [thread] on 72-count Aida. Is there really a 72-count Aida, or is it some form of linen? And what is the mouline thread? I've always used regular old cotton floss . . .
Could be lost in translation, maybe? I've been slowly working through my stitching goals for the year. Slowly being the key word. I think I've only accomplished a handful. The easy one (or maybe not so easy) was not to buy any new stash unless it was absolutely necessary to complete a current project! The second one was to complete one page of HAED's "Queen of Hearts" which I did earlier this month. Now I've been working on HAED's "Mad Tea Party". This one is ultimately going to be for my niece. She is currently 9 years old. I might have it done by the time she turns 18! LOL! This one I decided to do a little differently than my other HAED's. I am doing this one 2 over 1. It definitely makes a difference in the appearance but at times makes it difficult to get the needle through the hole in the fabric. But over all I am pleased. Just makes it slow going. I haven't finished one page yet but I am halfway done with the first page. Ok, maybe a little more than halfway done! Here we go.... this may be the last post for a while as I'm going into hospital for an operation tomorrow but I finally got the second page of Faerie Melody done!! It'll be back to Storykeep Masquerade for the final page of the HAED BB SAL next and when she's all finished then it'll be back to Faerie Melody. See you all after the operation...... wish me luck?????? 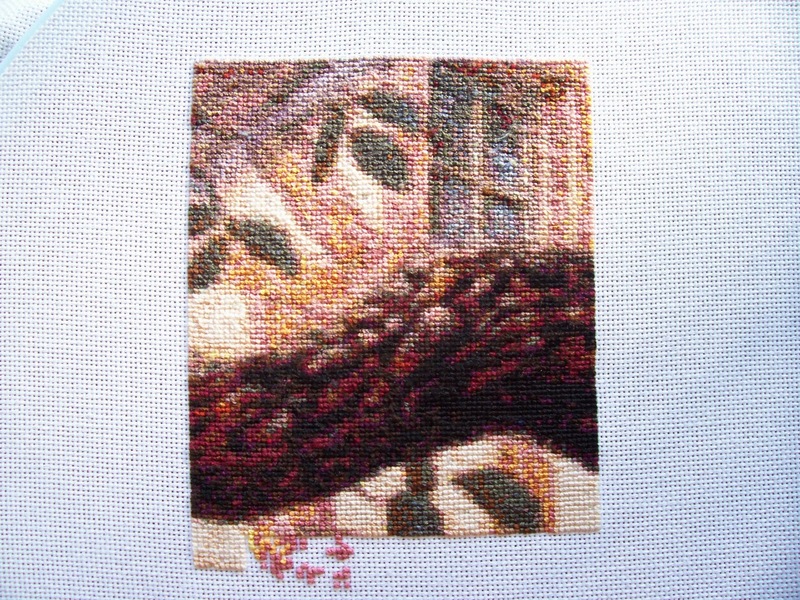 I have had a sore back lately and I haven't been able to sit at the computer for long periods like I usually do, so I have been cross stitching for hours every day! I finished another page a couple of day ago, except for an orange colour DMC 722 which I have run out of. I have ordered another one and I am waiting for it to come in the mail. I have also been working on the next pages as well...there are less than 8 pages to go! This is the first picture of my restart of Wrath. It's stitched on 25ct Lugana with tent stitches. The coverage isn't that great comparing with 28ct (which was my first experiment), but I don't care. Now I enjoy stitching again, instead of getting tired and annoyed. There are the first page and more than a half of the second one, her hair is really confetti-heavy so it's taking lots of time. So, after one day of only stitching, I have finished him. The joyful train. I was started on Feb 19. But there was a summervacation in between and a very sick relative. This project is not very large. But a very happy project. Next weekend Sanne an I search out a frame. It will not be easy. Red, blue, green, yellow, orange. many colors will fit in.Yes or no passepartout. We'll see. Anyway, I have my desk cleaned thoroughly, to place the Madonna of Christensen on it. Here I have been looking forward to. But when I started to the madonna before I'd finished the Train.I only have the Train in my mind. Now I only think what I'm still have in the planning. First Rose from Christensen and Medusa of LA. Williams. And there was on the blog of HAED a koicarp by MC.Escher. My son has koi and found him very nice. Well next year is already booked. I just have to say that you all just bowl me over. Not only are you all fantastic stitchers, but you are all so willing to help one another! I put out the call for multilingual buddies, and you answered that call. I've linked up an Italian speaking member with a new Italian buddy. So far I've had responses from members that speak German, Japanese, Spanish, Dutch, and French. You people are wonderful! I am keeping a list of all of you that agreed to be buddies, including the languages that you speak. I'll update my list as I get more requests. So if you've sent me an email volunteering thank you, I have you on my list and when stitchers request membership I'll link you up. I am in no way closing the call for volunteers, I'm jut keeping you updated. Thank you from the bottom of my heart, you are all truly fantastic people! Hello! This is the new development. I'll have to stop a little because I'm doing another SAL with another group. I hope to finish in two days so you can continue with HAE. I encourage all of you are going very well. As usual, the blues went into the Unicorn... bit by bit this page is getting close to be done! Your updates have been wonerful! Thanks for keeping this blog so pretty! I am posting with a request. Any members that speak other languages, besides English, if you are willing to be a buddy please email me. Put the word buddy and the language (other than English) that you speak in the subject line. I'm currently looking for a buddy that speaks Italian, but if you speak other languages and are willing, I will keep your name in reserve. Thanks in advance! What a Gorgeous updates of everybody. So much stitching buddys !!! Well, I'm started at the last 5000 stitches. It will surprise me when I get it done in November. There had been much in between. So you see, not everything is predictable. I have 19 days to finish it. That's about 265 stitches a day. You could say That it should work. I would love to start the Madonna. I am strong and I maintain. Then add the task to surge a nice colorful frame. I think I take my daughter in law, Sanne with me. Who has a good eye for bright colors. I'm sorry I haven't posted in a long while. I moved from Japan back to Germany and everything of my stitching things was in the mail for months. I'm in the mood for christmas and really want to start "Oh Kitten Tree" but I'm not sure if I want another HAED WIP. How many WIPs do you have at one time? Just Wanted To Pop In And Say! Queen of Hearts update Mel "Romantic Fool"